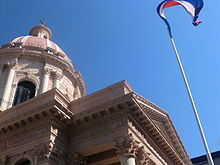 This article is about the capital city of Paraguay. For other uses, see Asunción (disambiguation). Asunción (Spanish pronunciation: [asunˈsjon]) is the capital and largest city of Paraguay. The city is located on the left bank of the Paraguay River, almost at the confluence of this river with the River Pilcomayo, on the South American continent. The Paraguay River and the Bay of Asunción in the northwest separate the city from the Occidental Region of Paraguay and Argentina in the south part of the city. The rest of the city is surrounded by the Central Department. The city is an autonomous capital district, not a part of any department. The metropolitan area, called Gran Asunción, includes the cities of San Lorenzo, Fernando de la Mora, Lambaré, Luque, Mariano Roque Alonso, Ñemby, San Antonio, Limpio, Capiatá and Villa Elisa, which are part of the Central Department. The Asunción metropolitan area has around two million inhabitants. The Municipality of Asunción is listed on the Asunción Stock Exchange, as BVPASA: MUA. Asunción is one of the oldest cities in South America and the longest continually inhabited area in the Río de la Plata Basin; for this reason it is known as "the Mother of Cities". From Asunción the colonial expeditions departed to found other cities, including the second foundation of Buenos Aires and other important cities such as Villarrica, Corrientes, Santa Fe and Santa Cruz de la Sierra. Asunción is considered a 'gamma city' by the study GaWC5. 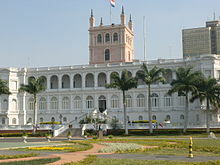 It is the home of the national government, principal port, and the chief industrial and cultural center of the country. Near Asunción are the headquarters of the CONMEBOL, the continental governing body of association football in South America. Asunción is said to be one of the cheapest cities in the world for foreign visitors. 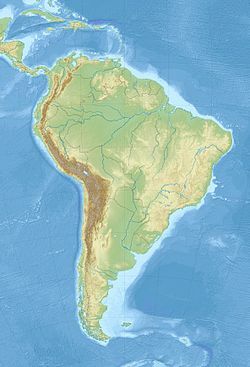 The Spanish conquistador Juan de Ayolas (died c. 1537) may have first visited the site of the future city on his way north, up the Paraguay River, looking for a passage to the mines of Alto Perú (present-day Bolivia). Later, Juan de Salazar y Espinosa and Gonzalo de Mendoza, a relative of Pedro de Mendoza, were sent in search of Ayolas, but failed to find him. On his way up and then down the river, de Salazar stopped briefly at a bay in the left bank to resupply his ships. He found the natives friendly, and decided to found a fort there in August 1537. He named it Nuestra Señora Santa María de la Asunción (Our Lady Saint Mary of the Assumption – the Roman Catholic Church celebrates the Feast of the Assumption on August 15). In 1542 natives destroyed Buenos Aires, and the Spaniards there fled to Asunción. Thus the city became the center of a large Spanish colonial province comprising part of Brazil, present-day Paraguay and northeastern Argentina: the Giant Province of the Indies. In 1603 Asunción was the seat of the First Synod of Asunción, which set guidelines for the evangelization of the natives in their lingua franca, Guaraní. In 1731 an uprising under José de Antequera y Castro was one of the first rebellions against Spanish colonial rule. The uprising failed, but it was the first sign of the independent spirit that was growing among the criollos, mestizos and natives of Paraguay. The event influenced the independence of Paraguay, which subsequently materialised in 1811. The secret meetings between the independence leaders to plan an ambush against the Spanish Governor in Paraguay (Bernardo de Velasco) took place at the home of Juana María de Lara, in downtown Asunción. On the night of May 14 and May 15, 1811, the rebels succeeded and forced governor Velasco to surrender. Today, Lara's former home, known as Casa de la Independencia (House of the Independence), operates as a museum and historical building. View of the city of Asunción during the Paraguayan War. After Paraguay became independent, significant change occurred in Asunción. Under the rule of Gaspar Rodríguez de Francia (in office 1813–1840) roads were built throughout the city and the streets were named. However, during the presidency of Carlos Antonio López (President 1844–1862) Asunción (and Paraguay) saw further progress as the new president implemented new economic policies. More than 400 schools, metallurgic factories and the first railroad service in South America were built during the López presidency. After López died (1862), his son Francisco Solano López became the new president and led the country through the disastrous Paraguayan War that lasted for five years (1864-1870). After the end of the armed conflict, Brazilian troops occupied Asunción until 1876. Many historians[which?] have claimed that this war provoked a steady downfall of the city and country, since it massacred two thirds of the country's population. Progress slowed down greatly afterwards, and the economy stagnated. After the Paraguayan War, Asunción began a slow attempt at recovery. Towards the end of the 19th century and during the early years of the 20th century, a flow of immigrants from Europe and the Ottoman Empire came to the city. This led to a change in the appearance of the city as many new buildings were built and Asunción went through an era more prosperous than any since the war. Asunción is located between the parallels 25° 15' and 25° 20' of south latitude and between the meridians 57° 40' and 57° 30' of west longitude. The city sits on the left bank of the Paraguay River, almost at the confluence of this river with the River Pilcomayo. The Paraguay River and the Bay of Asunción in the northwest separate the city from the Occidental Region of Paraguay and Argentina in the south part of the city. The rest of the city is surrounded by the Central Department. With its location along the Paraguay River, the city offers many landscapes; it spreads out over gentle hills in a pattern of rectangular blocks. Places such as Cerro Lambaré, a hill located in Lambaré, offer a spectacular show in the springtime because of the blossoming lapacho trees in the area. Parks such as Parque Independencia and Parque Carlos Antonio López offer large areas of typical Paraguayan vegetation and are frequented by tourists. There are several small hills and slightly elevated areas throughout the city, including Cabará, Clavel, Tarumá, Cachinga, and Tacumbú, among others. 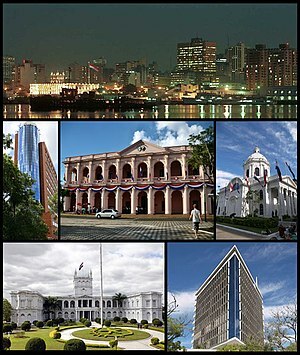 Asunción is organized geographically into districts and these in turn bring together the different neighborhoods. Asunción generally has a very short dry season between May and September, but the coldest months are June, July and August. Slight frosts can occur on average one or two days a year. The wet season covers the remainder of the year. During the wet season, Asunción is generally hot and humid though towards the end of this season, it becomes noticeably cooler. In contrast, Asunción's dry season is pleasantly mild. Asuncion's annual precipitation values observe a summer maximum, due to severe subtropical summer thunderstorms which travel southward from northern Paraguay, originating in the Gran Chaco region of the northwestern part of the country. The wettest and driest months of the year are April and July, on average receiving respectively 166 mm (6.54 in) and 39 mm (1.54 in) of precipitation. The population is approximately 540,000 people in the city proper. 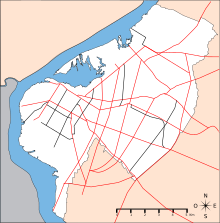 Roughly 30% of Paraguay's 6 million people live within Greater Asunción. Sixty-five percent of the total population in the city are under the age of 30. The population has increased greatly during the last few decades as a consequence of internal migration from other Departments of Paraguay, at first because of the economic boom in the 1970s, and later because of economic recession in the countryside. The adjacent cities in the Gran Asunción area, such as Luque, Lambaré, San Lorenzo, Fernando de la Mora and Mariano Roque Alonso, have absorbed most of this influx due to the low cost of the land and easy access to Asunción. The city has ranked as the least expensive city to live in for five years running by Mercer Human Resource Consulting. Approximately 90% of the population of Asunción professes Catholicism. 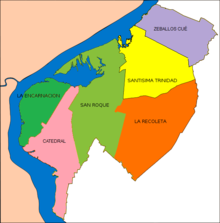 The Catholic Archdiocese of Asunción covers an area of 2,582 square kilometres (997 square miles) including the city and surrounding area and has a total population of 1,780,000 of whom 1,612,000 are Catholic. The Catholic Archbishop is Eustaquio Pastor Cuquejo Verga, C.SS.R. In Paraguay's capital there are also places of worship of other Christian denominations including the Church of Jesus Christ of Latter-day Saints, as well as of other religions including Islam, Buddhism and Judaism. Most people in Paraguay speak one of two languages as their principal language: Paraguayan Spanish (spoken by 56.9% of the population) and Guaraní (spoken by 11.1%). 27.4% of the population speaks the Jopará dialect, a mix of Guaraní with loanwords from Spanish (Creole). Other languages are represented by 4.5% of the population. The city has a large number of both public and private schools. The best-known public schools are the Colegio Nacional de la Capital (which is one of the oldest schools in the city, founded in 1877), Colegio Nacional Presidente Franco and Colegio Nacional Asunción Escalada. The best-known private schools are, American School of Asunción, Colegio San José, St. Annes School, Colegio del Sol, Colegio Santa Clara, Colegio Goethe and Colegio de la Asunción, Colegio Las Almenas, Colegio Campoalto, Colegio Dante Alighieri, Colegio San Francisco, Colegio San Ignacio de Loyola, Colegio Santa Teresa de Jesús, Colegio Inmaculado Corazón de María, Salesianito, Colegio Cristo Rey, Colegio Internacional. The main universities in the city are the Universidad Americana and the Universidad Nacional de Asunción (state-run). The Universidad Católica Nuestra Señora de la Asunción was founded in 1960 and has a current enrollment of around 21,000 students. The Universidad Nacional de Asunción, on the other hand, was founded in 1889 and has a much higher enrollment of just over 40,000 students. The Católica has a small campus in the downtown area next to the Cathedral and a larger campus in the Santa Ana neighborhood, outwards toward the adjoining city of Lambaré, while the Universidad Nacional has its main campus in the city of San Lorenzo, some 5 km (3 mi) eastward from Asunción. 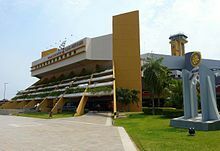 There are also a number of smaller privately run universities such as Uninorte, Universidad Católica Nuestra Señora de la Asunción and Universidad Autónoma de Asunción, among others. In terms of commerce, this sector has grown considerably in recent years stretching towards the suburbs where shopping malls and supermarkets have been built. Paraguay's only stock exchange, the BVPASA, is located here. The city itself is listed on it, as BVPASA: MUA. 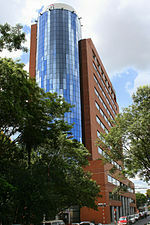 In Asuncion, the most important companies, businesses and investment groups are headquartered. The attractiveness of the city can be attributed to its easy going tax policies. Asunción has unrestrained taxes on the investments and movements of capital. In addition to this, the Asunción stock exchange traded up 485.7% in August 2012 relative to August 2011. There is also no income tax for investors in Bonds of Asunción Stock Exchange. Incentives like these attract significant foreign investment into the city. By many Latin American experts, Paraguay is tapped as one of the top three counties with the best investment climate in Latin America and the Caribbean as well it remains the most attractive nation of the hemisphere in doing business and is equipped with a series of legislations that protect strategic investments and guarantee a friendly environment for the development of large industrial plants and infrastructure projects.The city is the economic center of Paraguay, followed by Ciudad del Este and Encarnación. Because the Paraguay River runs right next to Asunción the city is served by a river terminal in the downtown area. This port is strategically located inside a bay and it is where most freight enters and leaves the country. There is a lesser terminal in the Sajonia neighbourhood, and a shuttle port in Ita Enramada, almost opposite the Argentine city of Clorinda, Formosa. Public transportation is used heavily and is served through buses that reach all the regions of the city and surrounding dormitory communities. 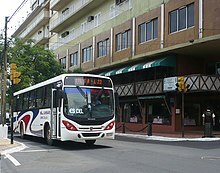 The main long-distance bus terminal is on the Avenida República Argentina and its bus services connect all of the Departments of Paraguay, as well as international routes to nearby countries such as Argentina, Brazil, Bolivia and Uruguay. Silvio Pettirossi International Airport is Paraguay's main national and international gateway, located at Luque, suburb of the capital Asunción. It is named after Paraguayan aviator Silvio Petrossi and is formerly known as Presidente Stroessner International Airport. As Paraguay's busiest airport, it is the hub of TAM Paraguayan Airlines. The city is home to the Godoy Museum, the Museo Nacional de Bellas Artes (which contains paintings from the 19th century), the Church of La Encarnación, the Metropolitan Cathedral and the National Pantheon of the Heroes, a smaller version of Les Invalides in Paris, where many of the nation's heroes are entombed. Other landmarks include the Palacio de los López, the old Senate building (a modern building opened to house Congress in 2003) and the Casa de la Independencia (one of the few examples of colonial architecture remaining in the city). Calle Palma is the main street downtown where several historical buildings, plazas, shops, restaurants and cafés are located. The "Manzana de la Rivera", located in front of the Presidential Palace, is a series of old traditional homes that have been restored and serve as a museum showcasing the architectural evolution of the city. The old railway station maintains the old trains that now are used in tourist trips to the cities of Luque and Areguá. Asunción also has luxurious malls that contain shops selling well-known brands. The biggest shopping malls are Shopping del Sol; Mariscal López Shopping, Shopping Villa Morra in the central part of the city, Shopping Multiplaza on the outskirts of the city and the Mall Excelsior located downtown. Pinedo Shopping and San Lorenzo Shopping are the newest and also sizeable shopping malls located just 5.6 and 9.3 kilometres (3.5 and 5.8 mi) from Asunción's boundaries respectively, in the city of San Lorenzo, part of Greater Asunción. In 2016 a new shopping mall, La Galeria, was inaugurated. It is in between the blue towers, and is now the largest shopping mall in the country. Association football is the main sport in Paraguay, and Asunción is home to some of the most important and traditional teams in the country. These include Cerro Porteño, Olimpia, Club Libertad, Club Nacional, Club Guaraní and Club Sol de América, which have their own stadiums and sport facilities for affiliated members. The Defensores del Chaco stadium is the main football stadium of the country and is located in the neighbourhood of Sajonia, just a few blocks away from the centre of Asunción. Since it is a national stadium sometimes it is used for other activities such as rock concerts. Asunción is also the heart of Paraguayan rugby union. The nightlife revolves around two areas: one in the downtown part of the city and the other in the neighbourhoods of Manora and Las Carmelitas, a night full of nightclubs and bars. Asunción also hosts several symphony orchestras, and ballet, opera and theater companies. The most well known orchestras are the City of Asunción's Symphony Orchestra (OSCA), the National Symphony Orchestra and the Northern University Symphony Orchestra. Among professional ballet companies, most renowned are the Asunción Classic and Modern Municipal Ballet, the National Ballet and the Northern University Ballet. The main opera company is the Northern University Opera Company. A long-standing theater company is Arlequín Theater Foundation's. Traditional venues include the Municipal Theater, the Paraguayan-Japanese Center, the Central Bank's Great Lyric Theater, the Juan de Salazar Cultural Center, the Americas Theater, the Tom Jobim Theater, the Arlequín Theater and the Manzana de la Rivera. 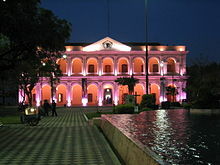 Asunción is also the center of Architecture in Paraguay. The choice of the seven treasures of cultural heritage material has been developed Asunción during the months of April and May 2009. Promoted by the "Organización Capital Americana de la Cultura", with the collaboration of the Paraguayan authorities participating in the election was carried out with the intention to disclose the material cultural heritage of Assumption. The most read newspapers are: Diario La Nación, Diario Popular, Diario ABC, Diario Última Hora, and Diario Crónica, although the most successful are Diario Popular and Diario La Nación. The most important tv channel are SNT and the other free to air channels Paravisión, Sur TV, Unicanal, Latele, C9N, RPC, Telefuturo and the public station of tv Paraguay TV. ^ a b "Paraguay Facts and Figures". MSN Encarta. Archived from the original on 2009-10-31. Retrieved 2009-07-07. ^ "World Weather Information Service - Asuncion". World Meteorological Organization. Retrieved November 8, 2012. ^ "Paraguay - Asuncion (pg 208)" (PDF). Climate Data for Selected Stations (1931-1960) (in Danish). Danish Meteorological Institute. Archived from the original (PDF) on January 16, 2013. Retrieved December 18, 2012. ^ "MECDigital " Demografía". Mec.gov.py. Retrieved 2011-03-13. ^ "Worldwide Cost of Living Survey 2007". Mercer.com. 2007-06-18. Retrieved 2011-03-13. ^ a b "Paraguay, quinto en esperanza de vida, en A. Latina - ABC Digital". Archivo.abc.com.py. 2009-05-22. Retrieved 2012-06-05. ^ "Paraguay - Estadísticas". Guiadelmundo.org.uy. Retrieved 2012-06-05. ^ "Cancillería. Secretaría de Relaciones Exteriores. Asuntos Federales y Electorales. Hermanamientos". Cancilleria.gov.ar. Archived from the original on May 20, 2007. Retrieved 2012-06-05. ^ "International Exchange". List of Affiliation Partners within Prefectures. Council of Local Authorities for International Relations (CLAIR). Archived from the original on 4 March 2016. Retrieved 21 November 2015. ^ "Intendencia se hermanó con Asunción | Intendencia de Montevideo". Archived from the original on 2013-10-29. Retrieved 2013-07-24. ^ Documento de declaración de hermanamiento entre las capitales latinoamericanas Archived May 10, 2013, at the Wayback Machine. Municipalidad de Madrid, URL último acceso el 18/11/2007. Wikimedia Commons has media related to Asunción.